Easy to grow popular hardy perennial herb with intensely flavored green leaves. Leaves may be used dried or fresh in salads, sauces, jellies, vegetables, meats, potpourris or as a garnish. 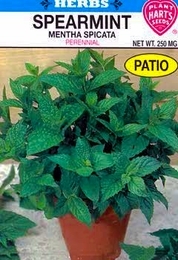 Mint will grow almost anywhere, in shade as well as in full sun. To keep from spreading, grow in a pail or pot in the ground. Cover drainage holes with pottery chips or gravel to contain roots. Planting time - Early spring to early fall.